I think Ella is growing on me. On Lucifer Season 2 Episode 3 quite a bit of banter happened between Lucifer and Mum and Luci and Ella as the team investigated a series of murders involving a killer who felt the need to punish. It was an all-out procedural this hour, which usually isn't the most fun when it comes to this show. But Lucifer made up for it by providing us with quite a bit of fun banter between some of the characters. 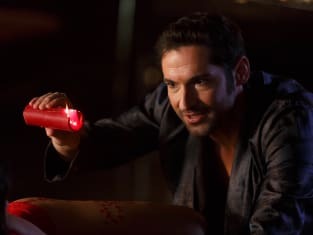 I especially enjoyed Lucifer and Ella's banter during the investigation of the first murder. Her smirk at Lucifer's corny one-liners was perfect. In fact, all of Ella's appearances this hour were quite enjoyable. I didn't feel like she was intruding upon a scene. Nothing felt forced. And, I really liked that she didn't continue her "God talk" with Lucifer. I really felt like she finally fit in. Maybe it was because Chloe was being so unbelievably serious this hour. Sheesh. The most fun we got out of Chloe this hour was during the first murder when all that fun banter was happening, and she became the mom, admonishing the two for their lack of respect for the victim. I guess maybe she's got a lot on her mind. Her and Dan are headed for divorce, and though she wasn't the one who brought it up, I'm sure it's been something she's been thinking about, but trying to ignore. She's all about Trixie (so is Dan), so it makes sense that they stop pretending if there's really nothing between them anymore. A Dan/Chloe divorce also opens up the door for a Lucifer and Chloe romance. While enticing, I hope it doesn't culminate for a very long time. However, it is a bit titillating to think about Chloe crying on Lucifer's shoulders when it all goes down, and somehow I get the feeling that maybe Lucifer will be there to help console Trixie too. Trixie is not going to take her parents divorce very well at all, I don't think. It wouldn't be surprising if she starts acting out because of it. Lucifer might look at a Dan/Chloe divorce as a huge opportunity to take advantage of a vulnerable Chloe in the beginning, but I think after thinking about it, he'll take a step back. Why? Because he really has deep feelings for Chloe that go beyond just lust. There's also the opportunity that Chloe and Maze might get together. Wouldn't that be cool? Now that Maze is focused on Charlotte as enemy number one, maybe Maze will lighten up about Chloe and see her as a friend rather than a threat. Chloe is going to need a good female friend to help her get through the difficulty of the divorce. I almost died when Charlotte showed up in Lucifer's bedroom when he was getting it on with the girl. The look on Lucifer's face was priceless when she started talking. What was better was when the girl thought Lucifer brought her a plaything only to find out that the "plaything" was his mother. Weird doesn't even begin to describe it. I probably would have left too. I'm absolutely loving Lucifer and Charlotte together. Their interactions are hilarious. How long before Chloe finally gets it that Charlotte is somehow connected to Lucifer? If she finds out that Charlotte is Lucifer's mom, will she finally believe? Charlotte is quite embarrassing especially as she discovers new human traits within herself. I wasn't sure if I was going to like the idea of her returning to her life as "Charlotte Richards," but I think it's going to be really interesting seeing how she copes with it. Charlotte being with kids is going to be as funny as Lucifer is with kids. I can't wait to see it. Plus, how is she going to deal with her husband? I don't see that ending well at all. Especially now that she knows she still has some celestial powers. Did anyone else think Lucifer was going to send her right back to hell, no questions asked, when he flashed his red eyes at her? We haven't seen anger like that in quite a long time. Dr. Linda needs to chill out. Does she always have to be working? Why can't she just hang out with Maze and talk like a girl instead of talking like a therapist? The woman needs to let her hair down. Will Amenadiel ever share with anyone about what's going on with his wings? I'm a little surprised that Maze didn't pick up on the feather situation. Couldn't there have been at least one feather that floated out of somewhere? He can't keep the issue a secret forever. I actually thought Charlotte was going to figure it out when she hugged him, because she pretty much knew right away who he was even if he had no clue about her. Besides, isn't that something a mom would just know? That there's something wrong with your kid? What did you think of "Sin Eater"? Hit the comments below and share your thoughts. If you need to catch up, you can watch Lucifer online, right here via TV Fanatic. Lucifer Photos from "Sin Eater"